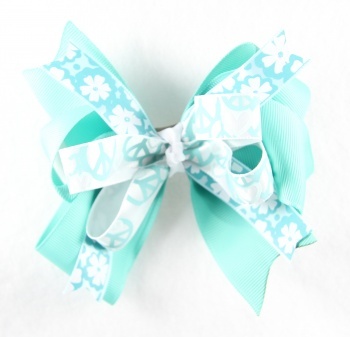 Peace Signs, Flowers and Hearts- a true blue lovers bow. This is a turquoise color base bow that is topped with 2 lines of white and turquoise flowers that have a sparkling center. Then a Peace sign bow sits on top- it has Peace signs and hearts all over. The center is wrapped with a white French knot 3/8" grosgrain ribbon and attached to a French clip. Peace Out to the Turquoise Lovers!